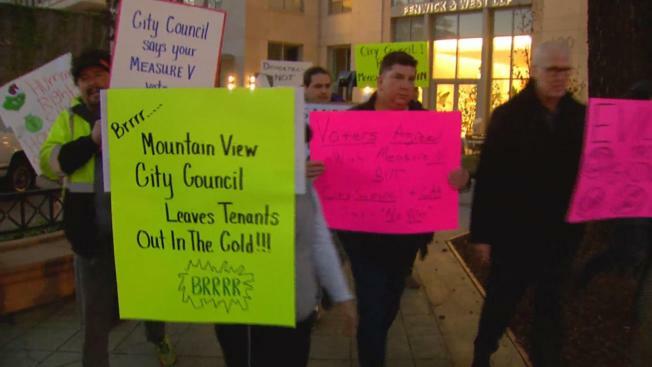 Renters in Mountain View were outraged Thursday after learning a judge approved a temporary restraining order against Measure V, the rent control initiative approved by voters in the South Bay city. The restraining order, requested by the California Apartment Association, blocks the measure that was set to take effect Friday. That means thousands of people essentially will be paying more rent next month than they expected. And they're not happy about it. "People are being displaced on a regular basis," said Daniel DeBolt of the Mountain View Tenants Association. "Rent increases are insane." The tennants association protested the restraining order Thursday evening with a march through the streets of Mountain View. The city manager's office released a statement Thursday, confirming the city did not contest the order, though it might in the future. "Pretty outrageous," DeBolt said. "It feels like a betrayal. The City Council's been fighting us for over a year on rent control." Tenants are saving rent receipts and consenting with an attorney. "We believe strongly in the constitutionality of every part of Measure V, and we're going to fight to defend it as long as it takes," said Juliet Brodie, lawyer for tenants. "It's very frustrating that people can just come in with a lawsuit and halt the will of the voters." For now, and over the next two months until it's addressed in court again, people in Mountain View who qualify for rent control won't get it.